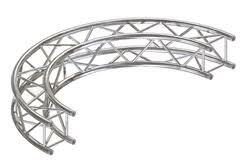 Curved truss is a lot more appealing and interesting from a visual perspective. Aluminum curved box truss bolts together to create circles, arches, and stage lighting structures and quickly rig and fly lighting systems. It adds a unique touch to small events, musical performances and celebrations.